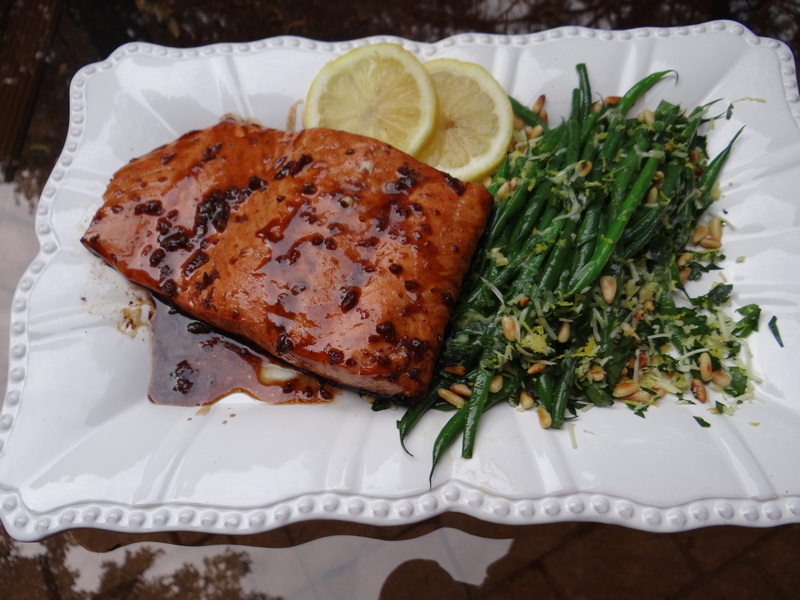 Foodie Friday – The best Salmon and Green Bean Dinner! This past weekend, my husband and I prepared the most delicious dinner. We sat outside on our patio, lit the candles, listened to jazz music, and enjoyed a really relaxing dinner. We had Salmon with Balsamic Maple Glaze and Green Beans Gremolato. Now, don’t let the titles of these recipes intimidate you. They are really quite easy to make. Just leave a little extra time during dinner to sit back and relax. You are going to want to enjoy every bite! Season salmon steaks with salt and pepper. Combine juice, maple syrup balsamic vinegar and garlic in a small saucepan. Bring to a boil and cook for 5-6 minutes; stir in oil. Brush steaks with this glaze generously and often while grilling on medium-high for about 10 minutes. Serves 4. 1. Bring a large pot of water to a boil. Add green beans and blanch 2-3 minutes, until tender but still crisp. Drain beans in a colander and immediately put them in a bowl of ice water to stop the cooking and preserve their bright green color. 2. Place pine nuts in a dry sauté pan over low heat and cook for 5-10 minutes, stirring often, until lightly browned. Set aside. 3. To make gremolata, toss garlic, lemon zest, parsley, Parmesan, and pine nuts together in a small bowl and set aside. 4. When ready to serve, heat olive oil in a large sauté pan over medium-high heat. Drain beans and pat dry. Add means to skillet and sauté, turning frequently, 2 minutes, until coated with olive oil and heated through. Remove from heat. Add gremolata, and toss well. Sprinkle with 3/4 teaspoon salt and 1/4 teaspoon of pepper to taste and serve hot.